This study aimed at elucidating phytodiversity of pasturelands of North-western Kashmir Himalayan biotic province in relation to various environmental gradients, with added focus on assessing distribution of important threatened medicinal plant taxa across surveyed pasturelands. A total of 16 sites that spanned across a broad altitudinal gradient (2502–4120 m) were selected. Phytosociological data like density, cover, frequency and abundance of vascular flora were collected and processed using gradient analysis. Soil moisture, nitrogen, organic carbon, acidity and electrical conductivity, altitude, degree of slope and human disturbance were recorded from each site. Analysis of species composition showed a total of 293 species of vascular plants, belonging to 192 genera and 64 families recorded from surveyed sites. Rank abundance exhibited that majority of species are locally rare and patchily distributed, with over 60% of species recording frequencies between 0%–20% and none showing frequencies more than 80%. Species richness showed significant variations and ranged from 20 (Parihasmaidan) to 114 (Nagbarren) for macro and 3.53±2.11 (Thajwas) to 8.76± 1.01 (Marsar) for micro-scale of measurement. The Shannon-Wiener (H′) and Simpson’s diversity (Ds) indices also varied greatly and were recorded highest (H′= 2.76 & Ds= 0.36) for Marsar and lowest (0.87 & 0.62) for Parihasmaidan. The diversity attributes suggested that pasturelands with lower species richness and diversity on macro-scale were not always species poor and less diverse on micro- measurement scale. The life form groupings highlighted the hemicryptophytic character of vegetation and species with highest importance value index were Sibbaldia cuneata (5.71), Rumex nepalensis (2.89), Juniperus wallichiana (2.88), Cynodon dactylon (2.83), Poa annua (2.49) and Sambucus wightiana (2.41). The results of canonical correspondence analysis showed that effect of altitude and anthropogenic disturbance was overriding and among various environmental factors, species distribution was mainly correlated with altitude along first canonical axis, while to second axis anthropogenic disturbances were important. Using generalized additive model, these variables also appeared as significant predictors for distribution of various threatened taxa. 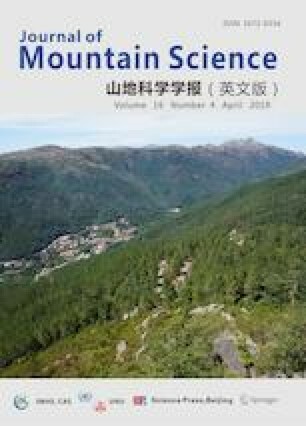 The findings of this study may thus help in evolving an appropriate strategy and an ecological management tool for long term conservation and management of these mountain ecosystems. Supplementary material (Appendixes 1) is available in the online version of this article at https://doi.org/10.1007/s11629-018-5104-1. The work was funded by University Grants Commission, New Delhi under its Dr. D. S Kothari PostDoctoral Fellowship Program (F-4-2/2006(BSR)/13-674/2012(BSR) awarded to the author.